Representations and descriptions of the authorized appurtenance attachments for ribbon bars. Ribbon appurtenances are devices affixed to award ribbons. They are worn to denote additional awards, participation in a specific event, or other distinguished characteristics of the award. Five point stars are presented in blue, silver and gold and are shape of a five point star. The appurtenance measures 3/16 of an inch in diameter and shall be positioned beginning in the center of a ribbon award and then alternating from the right then to the left of the center star. Description: Denotes the 2nd through 4th reception of any Department Award, excluding the Honorable Mention Ribbon Award and the Military Service Award in which case an oak leaf is used instead of a star. The Outside Governmental Agency Award is also excluded. A blue star also denotes the 6th through 9th reception of an award when used in combination with a silver or gold star. Description: Denotes the 5th reception of any Department Award, excluding the Honorable Mention Ribbon Award and the Military Service Award in which case an oak leaf is used instead of a star. The Outside Governmental Agency Award is also excluded. A silver star on the NATO Summit Service Award Special Recognition ribbon bar identifies Department Members assigned or detailed to the Mobile Field Force, Intelligence Section and the Area Central Bicycle Patrol Unit during the NATO Summit. Description: Denotes the 15th reception of any Department Award, excluding the Honorable Mention Ribbon Award and the Military Service Award in which case an oak leaf is used instead of a star. The Outside Governmental Agency Award is also excluded. Description: This appurtenance is dark blue in color, surrounded with a gold color border, and features four white stars. It has one star positioned at the top and three additional stars positioned across the lower border. The appurtenance measures 49/200 of an inch high, 17/50 of an inch wide, and 11/200 of an inch thick and shall be positioned in the center of the Honor Guard Award Ribbon. 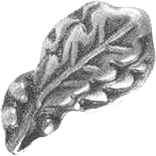 Oak leaf clusters are presented in bronze or silver and depict a twig of four oak leaves with three acorns on the stem. The appurtenance measures 5/16 of an inch long and shall be positioned in the center of the Honorable Mention Award Ribbon or the Military Service Award. Description: Denotes the 90th through 149th reception of a Honorable Mention Ribbon Award. Also denotes the military service of a Department member when worn on the Military Service Award, in which case the bronze oak leaf cluster also denotes the 1st through 4th deployment within any branch of the United States Armed Services. In the case of the Military Service Award the oak leaf cluster replaces the use of a blue star. This appurtenance is exclusive to the Honorable Mention Ribbon Award and Military Service Award. Description: Denotes the 150th and greater reception of a Honorable Mention Ribbon Award. Also denotes the military service of a Department member when worn on the Military Service Award, in which case the silver oak leaf cluster also denotes the 5th and greater deployment within any branch of the United States Armed Services. In the case of the Military Service Award the oak leaf cluster replaces the use of a blue star. This appurtenance is exclusive to the Honorable Mention Ribbon Award and Military Service Award.